Joanne and Ben got held their wedding at Bordesley Park in Redditch, Worcestershire. 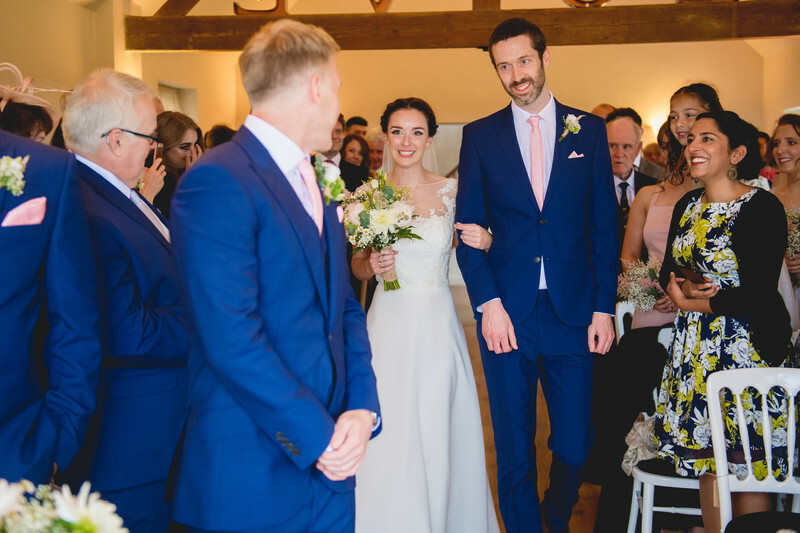 This photo shows the moment that Joanna made her entrance into the wedding ceremony room, escorted down the aisle by her older brother. I absolutely love the expressions on the faces of both Joanne and her brother, they both look so happy and Joanne is giving a gorgeous smile to her soon to be husband. When it comes to photographing the wedding ceremony, I always try and shoot from this sort of angle if I'm able to stand at the front of the room. I always try to give the image as much context as I can by including the groom in the side of the photo, out of focus as he may be. As there were a lot of guests for this wedding and the aisle wasn't all too wide, I shot with a wide angle lens in order to include some of the guests in the photos too. It's all too easy at this time of the day to really zoom in and focus on just the bride or groom, but I like the added dimension of being able to see the wedding guests too. The light in the ceremony room at Bordesley Park couldn't be better, as there's a large set of windows right at the end - as the bride walks down the aisle she gets ever brighter until she finally meets the groom at the end of the aisle. This open space and bright light is perfect for wedding photography, and it makes such a pleasant change from cold and dimly lit churches!